Copy the chess engine to a directory on your computer. You should see a small gray "install engine" window. Click OK.
Rybka is a UCI engine. UCI is the most popular computer chess language. 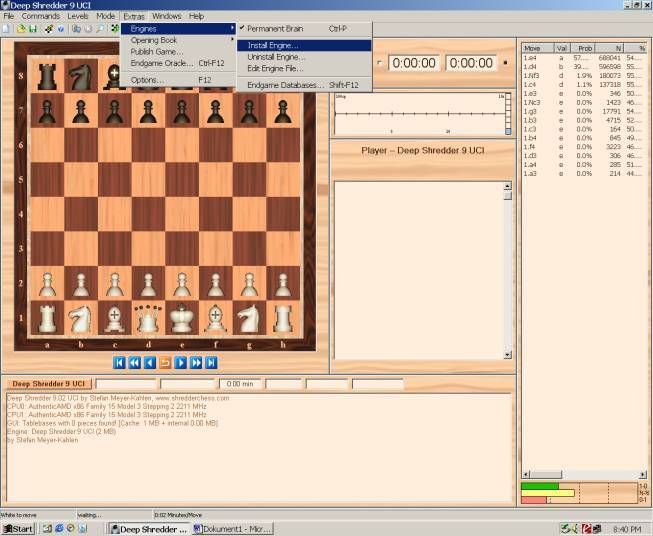 More precisely UCI is a protocol for communication between chess engine and chess GUI. 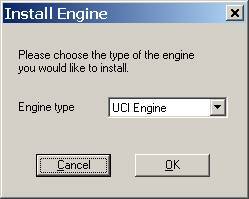 Every major chess GUI supports the UCI protocol. Find the directory you copied Rybka to. Now you only have to change the engine. To do that, click on icon of the engine you are currently using. On the picture below it is Deep Shredder 9 UCI. In the gray window "Change engine", which will appear, you will see list of engines. Pick the one you want to analyze chess with and click LOAD. Choose the numbers of MB for hash tables according to the type of computer you have. 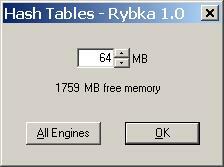 Rybka uses this memory to remember the positions it has searched, so a bigger hash table will slightly increase Rybka's playing strength. Just make sure that your computer has enough memory for the hash tables as well as any other applications (programs) which are running (e.g. music in the background). If you set the hash table size too high, the operating system will start using the hard drive, which you definitely want to avoid. If you're not sure, choose a small value. If you choose to big number for your hash table it can slow down the engine. Tip: Calculate Hash tables size as a total amount of your computer's RAM divided by 4. Click OK. You are finally done.